It’s hot outside! How nice to dive into the koi pond, deep into that cool blue pool. 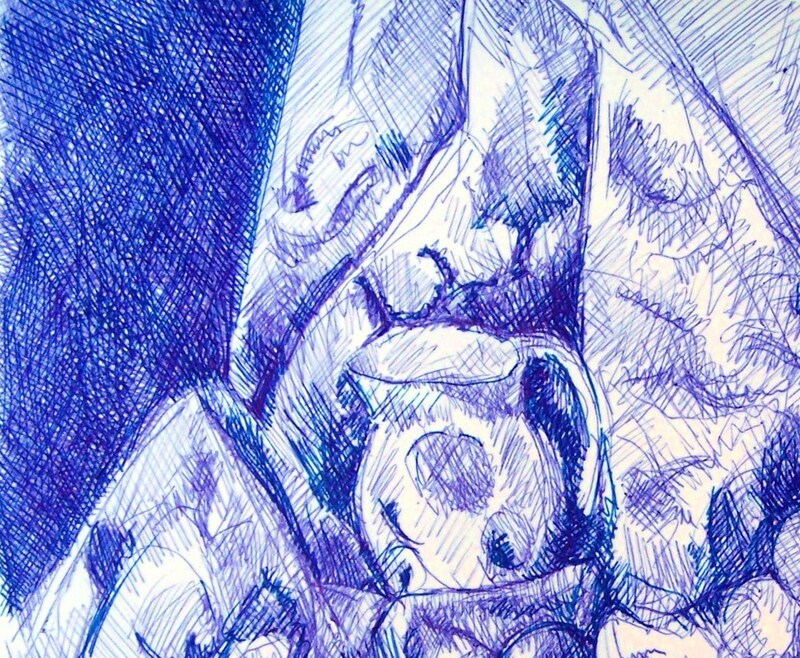 A blue pencil taken up in hand, examined, applied to the page — its blue alone is something to cool you off. Gazing upon the blue colors, even far from water, even without swimming, the blue that can as easily be a sky as a pond — that blue will take you wherever you need to go. It is worth the journey. The journey into blue. Orange fish make themselves the opposite of this blue and dash it up with their contrariness. Some thoughts come like splashing — they just arrive boldly. There they are. Like fish who came from unknown depths — for just this moment now — to come into a present into which they belong. I don’t know if I ever posted a version of this picture before. I had finished all but the top right-hand corner before I set it aside. Only recently did I rediscover and finish it. 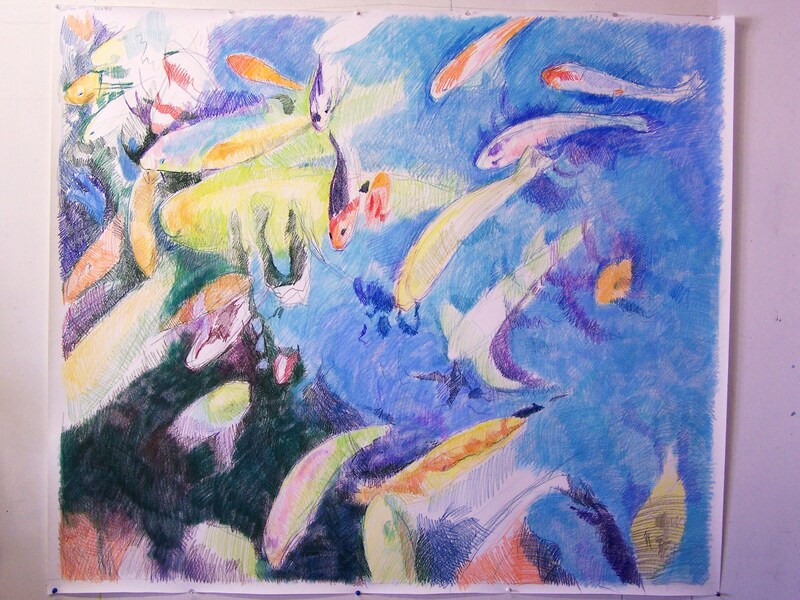 This drawing measures 18 x 24 inches so the gesture of the marks falls in between the small and the huge koi drawings. I fell in love with hatching a long time ago. 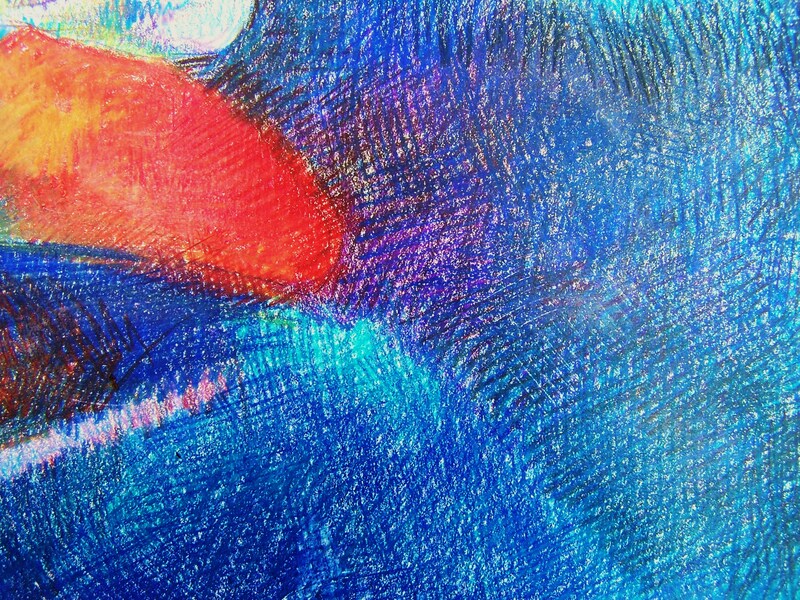 Not only is hatching a beautiful way to make gradations of light and dark, but it is physically and mentally assorbing to do. Perhaps it holds the same hypnotic charm as knitting. You can carry a drawing like this around and do this “knitting” wherever you happen to be since so much of its character resides in the repetition of the little hatch marks. I used to have qualms about colored pencils. Colored pencils were supposedly an inferior medium, not suited to serious art. But my child-like nature (I love all art toys) along with the natural seductiveness of the medium itself lured me. It helped that I needed a safe medium to use when my daughter was a crawler. 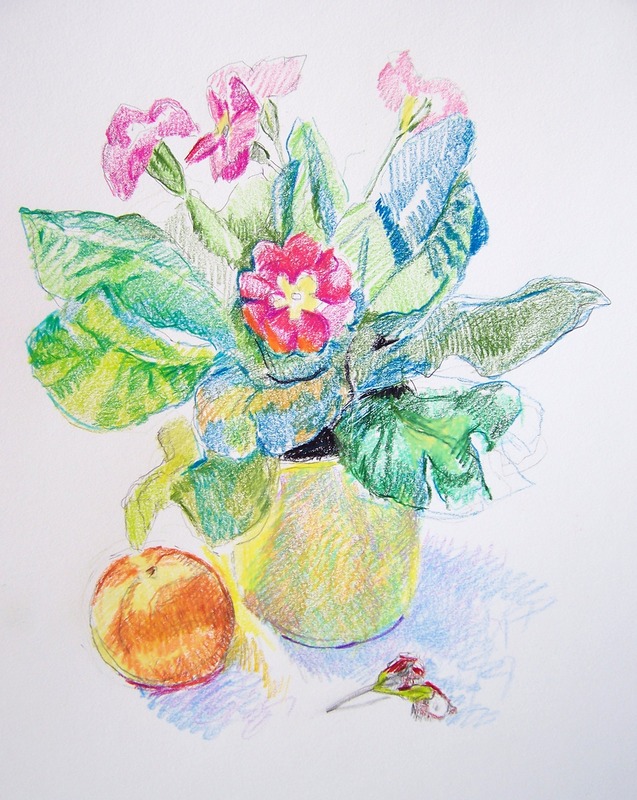 My love affair with colored pencils began during my daughter’s infancy, but years of using the pencils has confirmed in me a sense that they are as “serious” as you want them to be. Pshaw! Or as frivolous! Earlier this week I made a copy after Cezanne’s “Still Life with Apples and Peaches” in ball point pen that is similarly filled with hatchings. The technique common to both drawings makes these sister drawings even though the subjects are quite different. In each instance the technique means that you have to create a surface that has its own raison d’etre. The blues of this passage of interwoven pencil lines, and the texture of the pen marks each have to make sense on their own — apart from what they portray. One advice I would offer to people learning to draw would be to experiment with the materials. 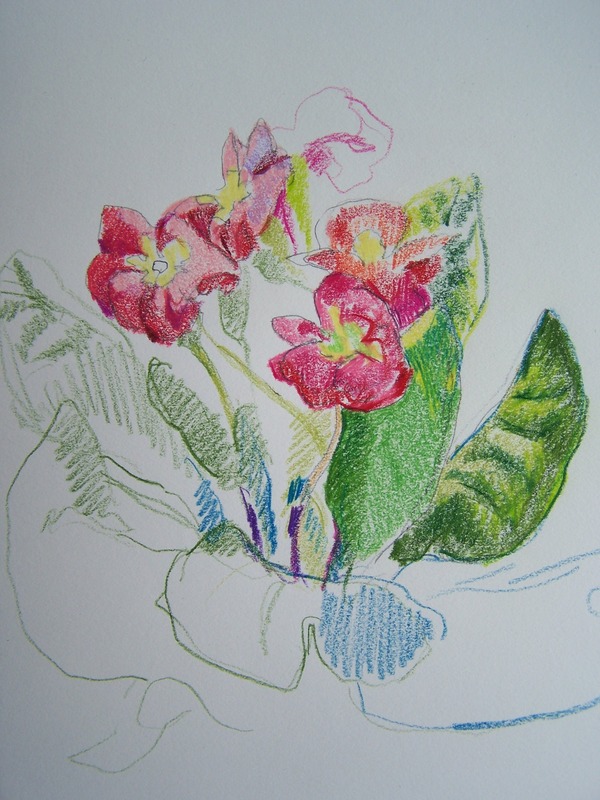 Drawing is a separate skill from mixing colors or from knowing how to use a particular artist’s material — colored pencils in the example above. You can separate out the tasks, like color mixing, and gain mastery of the parts in ways that prove helpful later when tackling a whole drawing. For color I think you should mix everything with everything. Ignore the advice that says “only do this” or “only do that” and instead just go crazy. Especially ignore the “never” advice. The main thing about color and color mixing is simply to notice what happens. Be very alert to the visual properties of whatever mixing you do. How does mixture or juxtaposition change the character of the colors? Particularly important is how does the melange of colors make you feel? Color can by-pass reason and zip right straight into your head, affecting your mood. Learn not only what combinations create this or that color, but what combinations create this or that emotion. 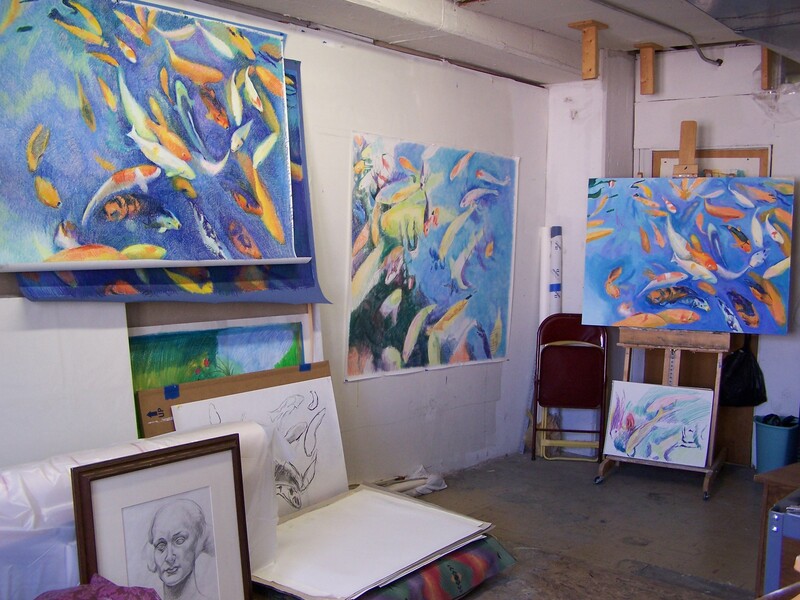 Someday, then, the artistic problem becomes more interesting: how to mix the feelings …. Work on the new koi pond got off to a good start. I’m doing an experiment with this one, having made the underdrawing with colored pencil over which I’m using Caran d’Ache water soluble crayons in veils of color (like water color). Some of the early pencil lines will show through from beginning to end so there should be a different feel in the picture’s texture. 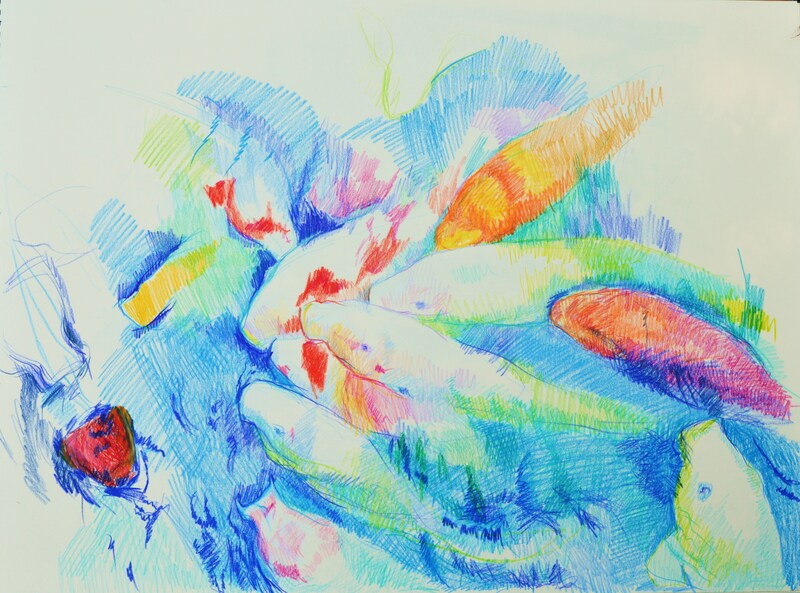 Early on the colored pencils have an open, airy look like a drawing made by spiders spinning colored lines of web. But by the time today’s work was done, a new pond was beginning to appear. Still lots of work ahead, of course. Lots of wonderfully enjoyable work ahead. I’ve gone fishing. Again. Had to do some research yesterday so I went swimming. Ah hem! Okay, it wasn’t all research, it’s just that I had to take the kid swimming. Perhaps I wanted to go as well. 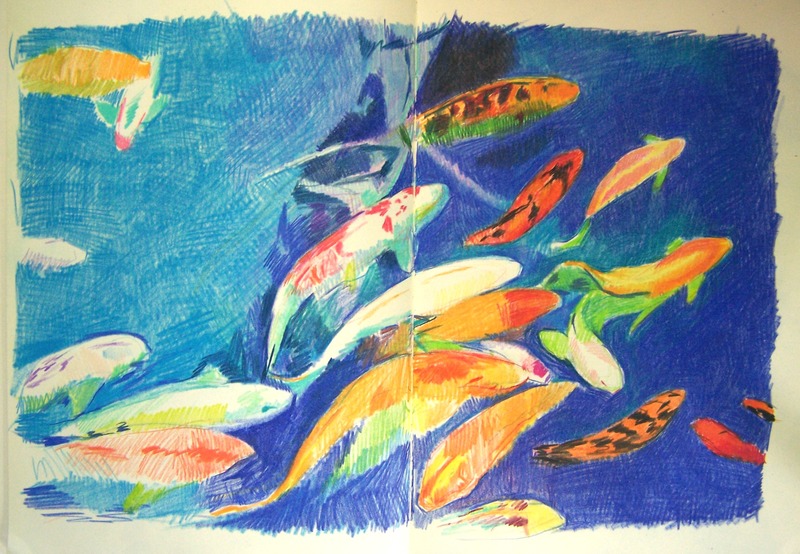 But even beside the beautiful blue of the swimming pool, I could not let go of my koi. In our beach bag of supplies, besides the sun block and the snacks, I took colored pencils and my big tough notebook. 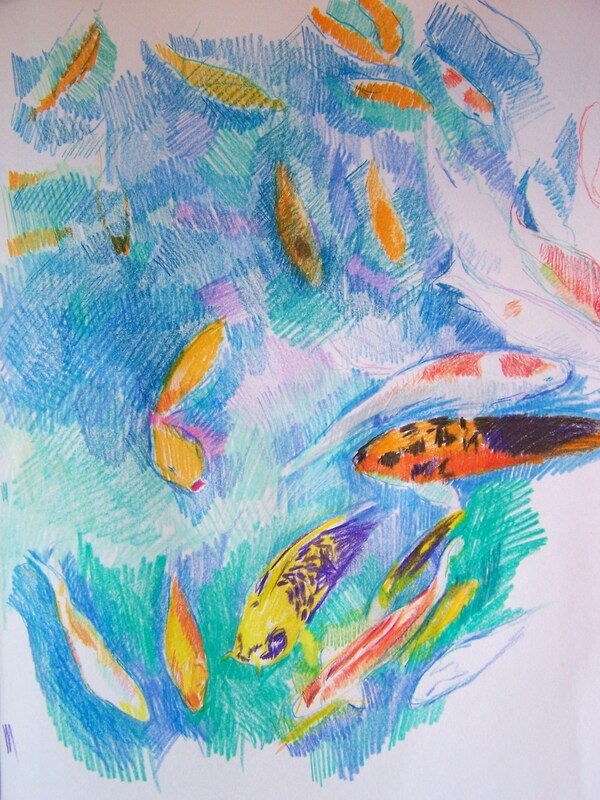 My pencils were pre-sharpened (though I have a handy portable sharpener like kids take to school) and I drew blue patches and fish silhouettes. Was thinking about how people learn to draw, and I decided that this would be a pretty good first foray into art for those so inclined: to take simple materials like colored pencils (for the pool I use the cheap dime store brands!) and make color patches. You put colors beside other colors and teach your eye to marvel at how certain color combinations make your perception dance. 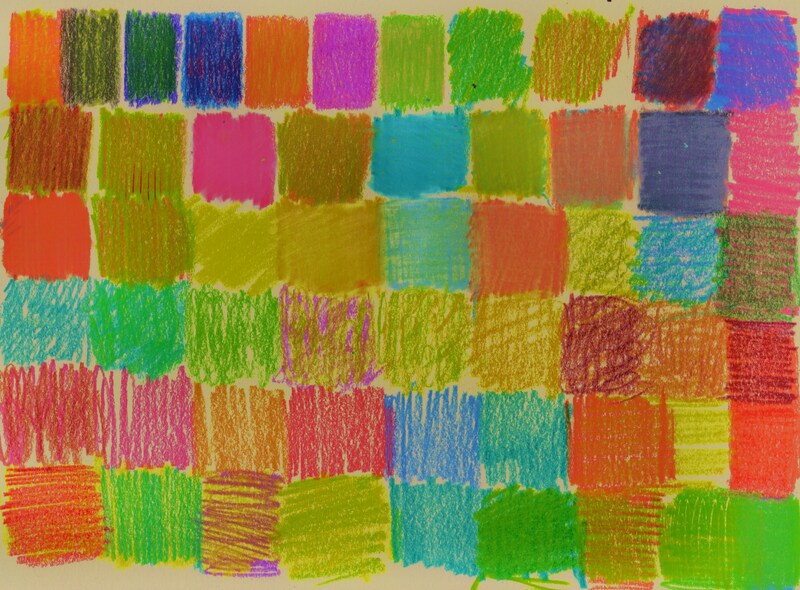 I think of it as proto-art — that first impulse to mark, to color, to decorate, seeking and discovering delight. For me these pool side drawings are experiments with different patterns. But for someone else they might also provide simply a beginning. I swam a lot too. In between swimmings, I swam in the pond of thought. 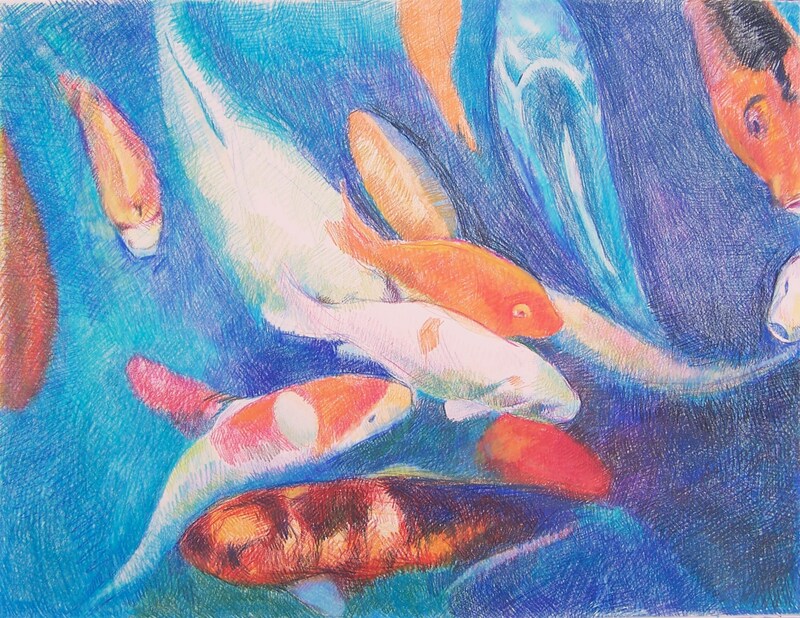 Being in the pond, I learn the role, find my inner fish, work to get inside the Koi mind. And outside the pond, I play like a child with my artist’s tools. I wrote yesterday about being a lazy draughtsman, how drawing from photos and searching for my inner Xerox machine lets me tune out everything except the color patches before my eyes. 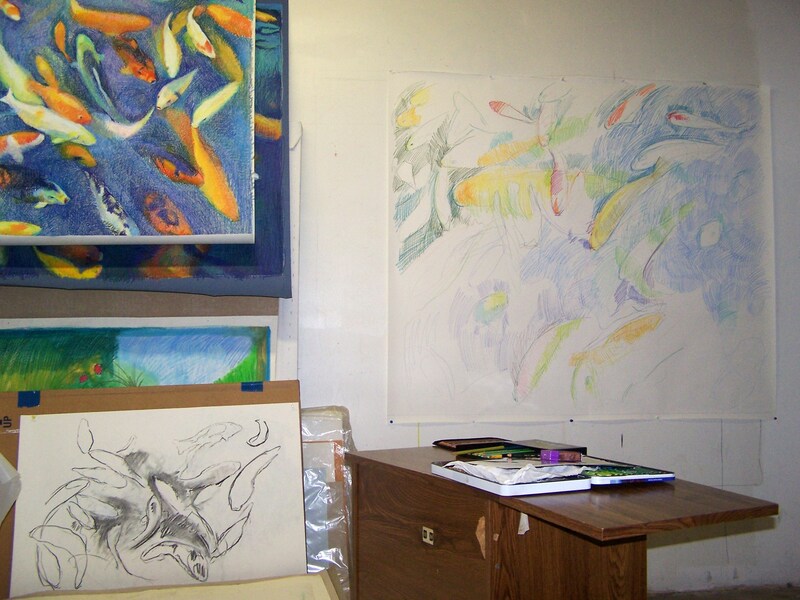 It’s an uncomplicated kind of art in which I sometimes find refuge. And, well, I went refuge seeking again today, having enjoyed it so much yesterday, and made a couple more drawings of my daughter in her “princess” dress. She was playing with caterpillars. Sometimes I just want to draw, and I don’t want to have to think. I want to look and copy. I get lazy sometimes. Working from photos can provide that kind of idea off the shelf, and I use photos sometimes to satisfy my craving to record and describe. So today I browsed through some old photos of my daughter when she was young enough to dress up in gauzy princess dresses. In the photo, she’s gazing at a caterpiller on her arm (less evident in my drawing). When she came home from school today and saw this sketch, she quizzed me about why the arms look “funny.” It’s tough being an artist. Everybody’s a critic — even your kid! So I happened to have an out-of-focus photo taken on the same occasion, and I used it to show her how funny and “abstract-looking” things appear when they are less acutely seen. Certainly my drawing introduces distortions too. But distortion in art often has meaning, more so than artists typically realize, I think. The drawing is, after all, a record of one’s visual thoughts. I wasn’t able to “finish” this drawing. We had to hop and be on our way, errands to run. But the moment of suspension — ah, that too — often adds a telling something-or-other. I liked how the edges of the picture angle in a raucous this way and that. It has a bit of caterpiller zig-zag that befits my theme. It’s also fun, as a mom, to use a photo to reconnect with memories of my daughter’s girlhood. Childhood sweeps past us so quickly, too quickly. And it’s important to catch whatever you can, when you can, and hold it, and amaze yourself with it. Like a caterpiller crawling on your arm. I drew the garden again. Made this one a little bigger.